I have been playing along with all of the celebration going on at Papertrey Ink, they are celebrating their 11th year! This card will be entered into their Transformation Tuesday Challenge, where you take a feminine card and make masculine. Here's my original card posted October 29, 2017. Still sweet as can be! You area transformation specialist! This is great, and you already had a card done so that you could lust change it up. 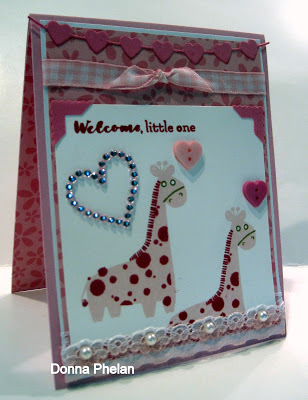 Both are so cute and now you have a baby card for a boy. Just saying. These are super adorbs!! Love both and you sure did transform the first one, what a fun challenge!! Cute, cute cute. I love them both. These are adorable!! You are the queen of transformed cards. Just so stinkin' cute. You NAILED that challenge. I loved the pink one, love the blue one too. Aren't those giraffes adorable?